This painting refers to money, but it isn’t just about money. Money issues are about survival, abundance, greed, security and safety, giving and receiving, and about worth. I chose the rattlesnake to represent the difficult emotions that grip me when money seems to be going wrong in my life. To choose an animal for the painting, I thought of the fauna to which I was exposed in childhood. I grew up in rattlesnake country, and of all the dangerous animals I could imagine, I am most familiar with the rattler. For the most part I never had a strong fear of them because they always give you warning to get away. But there was never any doubt that you were in trouble if you messed with one. 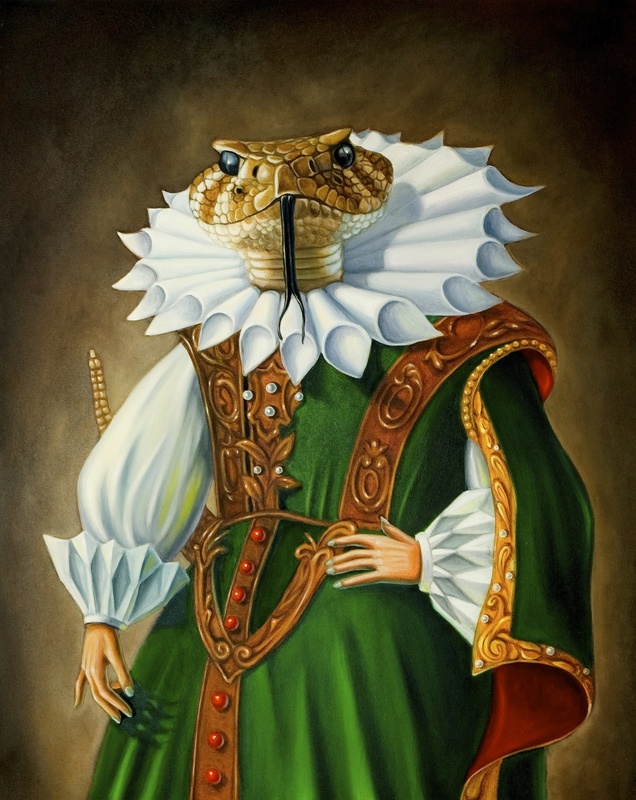 In defense of the snake, it is not portrayed as a demon in all cultures. In fact, in most cultures, it has a long list of beneficial and spiritual properties, none of which are negative. I only chose her for this painting because of the element of danger and her ability to strike at any time.